Slime Tube Sealant is non-toxic , non-hazardous , non-flammable , non-aerosol and water soluble, developed and tested to be used in all tube tyres. Slime Tube sealant prevents and repairs flat tires caused by puncturing objects up to 1/8″ (3mm) in diameter. It remains liquid and will not harden or dry out inside the tyre even when installed. It is guaranteed for 2 years. It prevents prevents and repairs punctures up to1/8″ ( 3mm ) using Fibro-Seal technology . It remains liquid inside the tyre , coating the tread area as the tyre rotates. Tubes treated with Slime can be patched with a conventional vulcanized patch using a bit of patience and care. Available in 80z and 16oz bottles, 1 gallon, and 5 gallons. 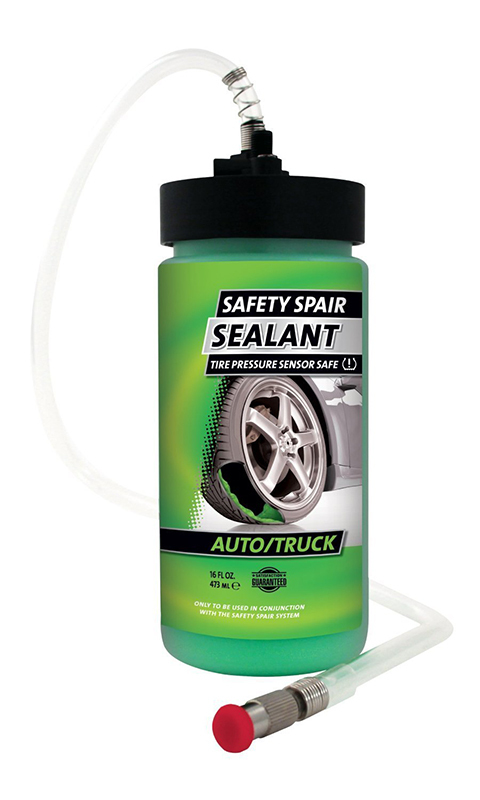 Safety Spair Tyre Sealant instantly seals punctures up to 1/4 inch using Fibro-Seal technology. This Safety Spair sealant cartridge refill is to be used with the Safety Spair flat tire repair system only. It is Tyre Pressure Monitoring System (TPMS) friendly. Passes directly through the valve core. Guaranteed not to void tyre warranty. 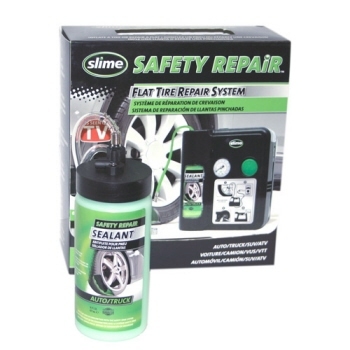 Slime Tire Sealant, non-toxic, non-hazardous, non-flammable, non-aerosol and water soluble which is designed and tested for use in all pneumatic tyres.Slime Tire sealant instantly and repeatedly repairs tread area punctures up to 1/4″ in diameter using Fibro-Seal® Technology. Slime for tubeless tyres can also be installed into tubeless bike tyres. It installs between the rim and the tyre bead. Hold the bead open with two tyre levers, install, and re-inflate with a fast burst of air to seat the bead to the rim. The black cap is a valve core remover tool. Unscrew this tool from the top of the cap, and use it to remove the valve core from inside the tyre valve stem. Attach the provided filler tube to both the bottle and valve stem. Squeeze in the recommended amount of sealant. Screw valve core back into tyre valve stem. Inflate tyre to recommended air pressure indicated on the outside of your tyre. Spin the tyre to distribute sealant to the puncture area if being used as a repair. Note: If tyre deflates after installation of sealant, examine tyre to confirm that there are no punctures larger than 1/4″(6mm) in tubeless tyres & 1/8″(3mm) in tube tyres. Remove any puncturing objects, then reinflate and immediately spin tyre to distribute sealant to the puncture area. The Slime chemists have developed a state of the art system of environmentally friendly fibers, binders, polymers and proprietary congealing agents that inter-twine and clot to seal punctures up to 1/4″(6mm) in tubeless tyres & 1/8″(3mm) in tube tyres. This Fibro – Seal lattice, together with the viscous transportation system, seeks out and tightly packs itself into any puncture area, preventing and repairing flats with a flexible long lasting plug. How Much Slime Per Tire? Click here for Slime Application Chart and Calculator.